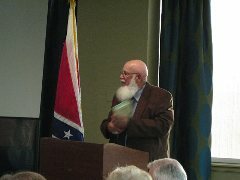 Arnold Schofield auctioning off April's first edition book. The Civil War Round Table of Kansas City held its 467th Regular Meeting on Tuesday, April 28, 2015. Troy Strahan and his son, Liam, gave a first person performance of Abraham Lincoln and Tad Lincoln. Troy and Liam reenacted the famous photo of Abraham Lincoln and Tad Lincoln looking at a book together. Using this scene, Abraham and Tad Lincoln discussed famous persons, such as "Little Mac," as well as,events that took place near the end of the Civil War. It was April 14, 1865 and Lincoln was spending some time with his son, Tad, before he had to get ready to attend, later that evening, a performance of "Our American Cousin" with his wife, Mary, at Ford's Theatre. After the performance, President Lincoln was kind enough to answer questions from the audience.